Adam Corner calls on Chris Huhne to stop applying to rhetoric of denial to people who disagree with specific policy proposals, arguing that that weakens the argument for anthropogenic climate change generally. In a speech to the annual Renewable UK conference in Manchester this week, the climate and energy secretary Chris Huhne launched a spirited defence of the renewable energy industry and the government’s commitment to supporting its growth. 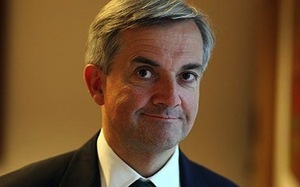 In what has been widely interpreted as a direct response to the decidedly unsupportive rhetoric of George Osborne’s speech at the Conservative party conference, Huhne hit out at the “climate sceptics and armchair engineers” who sought to derail progress towards a low-carbon economy based on renewable technologies. Huhne even went as far as labelling opponents of investment in renewable technologies ‘green economy deniers’ in a press release accompanying the speech. For the vast majority of the public who consistently report highly favourable attitudes towards renewable technologies such as wind and solar energy, Huhne’s passionate speech is likely to have resonated. But although Huhne’s support for renewables will be widely welcomed, he is playing a dangerous game by labelling those who oppose government investment in renewable technologies as ‘deniers’. Although some see the word ‘denier’ as an unacceptably loaded term to use in climate change debates, its application to those who refuse to accept the scientific evidence of human impact on the climate is justified. On the basic question of whether man-made emissions of carbon dioxide are causing temperatures to rise, the science really is settled. But the use of this term to describe people opposed to subsidies for renewable technologies is much more problematic – the politics of climate change are (and in some sense will always be) up for grabs. Of course, those who deny the science of climate change are also likely to oppose taking action to mitigate it. But it is perfectly possible to be opposed to a particular climate policy without disputing that something needs to be done. If Huhne can’t make the argument for renewable technologies without labelling those who oppose their use as ‘deniers’, then it opens the door for anyone to use (and abuse) this approach. The obvious example is nuclear power: to its advocates, it is a tried-and-tested method of generating low-carbon energy. Proponents of nuclear power could use the term ‘nuclear deniers’ to denigrate their opponents, but they would be no more justified than Huhne. There is a strong argument that the reason climate change has become such a politically divisive issue in the US is that ‘action’ on climate change has become synonymous with the policies and ideas of Al Gore, who was responsible for bringing the issue to the forefront of American politics over the last two decades. For those who oppose Al Gore, opposing his policies comes naturally. The problem arises when the scientific case for climate change comes to be seen as indistinguishable from Al Gore’s policies to mitigate it. It might be a bitter pill to swallow, but it is – perversely – in everyone’s interests for ‘alternative’ climate change policies to be developed and debated. When the conversation about climate change pits progressive-policy against conservative-policy (rather than progressive-policy against science denial), the battle for moving forward on climate change has already started to be won. Everyone is talking about what to do about climate change, not whether it is real. If government investment in renewable technologies is the progressive policy option of choice, then opponents to it should be taken on using the extremely strong evidence for renewables, not dismissed as deniers. Perhaps one reason that the genuine ‘denial’ and obfuscation of groups like the Global Warming Policy Foundation has been able to capture so much of right-leaning thinking on climate change is that those on the left have been too quick to label policy-sceptics as science deniers. Of course, some science deniers use ‘policy sceptic’ as a convenient smokescreen – their preferred policy alternative is ‘do nothing’. But a recent paper by Wouter Poortinga and his colleagues at Cardiff University shows that when people express scepticism about climate change in opinion polls, they often mean very different things. Poortinga and his colleagues found that although uncertainty and scepticism about the potential impacts of climate change was fairly common, both trend (i.e., ‘is it getting warmer?’) and attribution (i.e. ‘are humans causing it?’) scepticism were far less prevalent. Most people are highly favourable towards renewable technologies, and the arguments in their favour are persuasive. But it is critical that climate policy stays distinct from climate science. Otherwise, opposition to the former becomes denial of the latter – exactly the problem we need to avoid in the first place. Sure, stick on a crabon tax, reduce other taxes to compensate and wait 20 years. That is all we need to do. Fine. But there’s a higher percentage of climatologists who believe in AGCC than biologists who believe in evolution. So do accept that “debate” too? Also, build nuclear power plants already. Al Gore came to climate change long after the Republicans had dug into denial. The idea that if he wasn’t campaigning against climate change George W. and the Republicans would be constructively proposing solutions is beyond naive. Might I just mention boring facts like Dubya’s deep links to the oil industry and its massive funding of his party and administration?